University of Utah Health College of Pharmacy has received $2.6 million in contract funding from the National Institutes of Health to evaluate new small molecules to treat pain as part of the Helping to End Addiction Long-term (HEAL) Initiative. In the United States, the opioid crisis has reached epidemic proportions. More than two million Americans are addicted to opioid drugs, including prescription pain medicines, heroin and fentanyl. The Centers for Disease Control and Prevention estimate that more than 100 Americans die every day from an opioid overdose. The medical community needs alternative therapies to treat their patients. This one year of funding will expand on a NIH contract established with U of U Health through the contract site of the Epilepsy Therapy Screening Program (ETSP). Pain is a chronic disease that can accompany epilepsy. 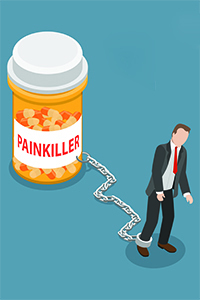 “We are going to look at novel compounds that might be effective for treatment of pain without addictive liability,” said Karen S. Wilcox, Ph.D., chair of Pharmacology and Toxicology in the College of Pharmacy and director of the contract site of the ETSPat U of U Health. Through this program, the university contract site of the ETSP will receive blinded samples of small compounds, natural products and biologics from the NIH National Institute of Neurological Disorders and Stroke (NINDS) to screen as potential,non-addictive treatments to alleviate painfor future clinical trials. “The ETSP has helped identify many potential therapies for epilepsy over the years and the scientific community will be able to take advantage of this resource to identify and characterize non-addictive pain therapies,” said Amir Tamiz, Ph.D., director of the Division of Translational Research at NINDS. Cameron Metcalf, Ph.D., associate director of the contract site of the ETSP at U of U Health, will apply his expertise in models of pain. Misty D. Smith, Ph.D., a co-investigator of the contract site of the ETSP at U of U Health, will investigate the therapeutic potential of novel compounds for pain. K.C. Brennan, M.D., associate professor of Neurology and Vice Chair of Research in the Department of Neurology at U of U Health, will examine efficacy of pain medication using migraine models. Dave Moody, Ph.D., director of Center for Human Toxicology at U of U Health, will apply pharmacokinetic assays to study the metabolism of test compounds. Kristen Keefe, Ph.D., professor of Pharmacology and Toxicology at U of U Health, brings her expertise in studying addiction by applying her expertise in self-administration studies. The HEAL Initiative aims to accelerate scientific solutions to stem the nation’s dependence on opioid-related drugs. The Initiative builds on extensive, well-established NIH research and programs to help researchers across the country integrate the most successful, evidence-based strategies in a number of communities hit hard by the opioid crisis. The funding offers new hope for the 25 million Americans living with daily chronic pain and the individuals, families and communities affected by this crisis.